This is our value canvas for the gigs we are planning to put on at the university. We have identified any issues that may arise, and also it has helped us to shape the best event we could think of. 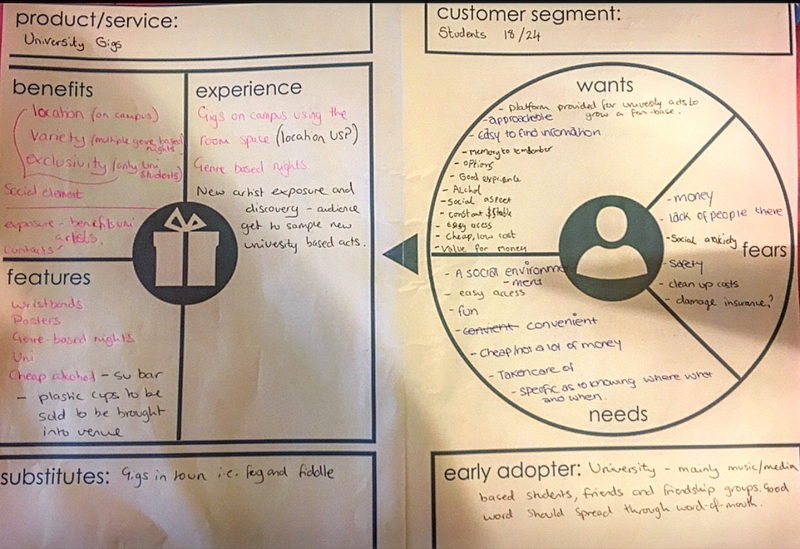 The canvas has also allowed us to work out the best use of test-marketing after learning who our early adopters will be and we can arrange our product trials I.e. smaller test gigs around them whilst gaining broader knowledge through our widespread questionnaires to as many students as possible at UOG. 4. Full gigs moving in a circuit around the universities with acts from each uni in the line-up to make uni-promo-gigs on tour.